Haiti Travel - The Cap-Haitien International Airport a will now be called: Aéroport International Hugo Chavez after the late Venezuelan President Hugo Chavez. The Hugo Chavez International Airport In Haiti? It seems like I got a lot of people upset when I said "nou si poze sispann achete figi" which I don't really care if I upset anyone. For those of you who replied to my comment thinking we have not done anything for Venezuela and any other country, I have one thing to say, learn your history. Haitians helped free Venezuela from Spain and Venezuela was not the only country in Haiti helping after the earthquake. Non, nou sipoze sispann achte figi. Menmke Chavez te fe yon jes a peyi nou sa pavle di pou nou pran yon bagay andedan peyi nou pou nou bal pot nonli. Pouki se pa non youn nan gro hero nou yo? mwen ta renmen menm exemple sa a a a continuer. si chak president banm yon rout oubyen yon pont peyi a tap gen yon lot vizaj. Maybe when we will build an airport of OUR own. with OUR own money. then we could name it after our own people. 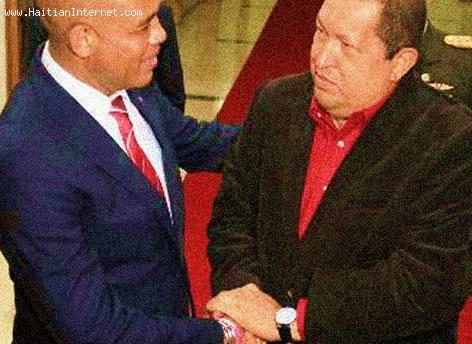 Hugo Chavez has done a LOT for Ayiti when he was alive. if there is power in a some areas of Okap, its thanks to him.